• Optional Ingredients: Mayonnaise, Dried Bonito Fish Flakes. 1. Begin by cutting the pork into small pieces, carrots and pepper into thin slices and roughly chopping the onion and cabbage. 2. Stir fry the pork until browned, then add the other vegetables except for the cabbage and cook until tender. 3. Add the cabbage after the other vegetables are ready. 4. Add the noodles to the pan, then mix together while adding the yakisoba sauce. 5. Once it is ready, sprinkle over aonori (powdered seaweed) and top with shredded pickled ginger. 6. For extra flavour you can add dried bonito fish flakes and/or mayonnaise. 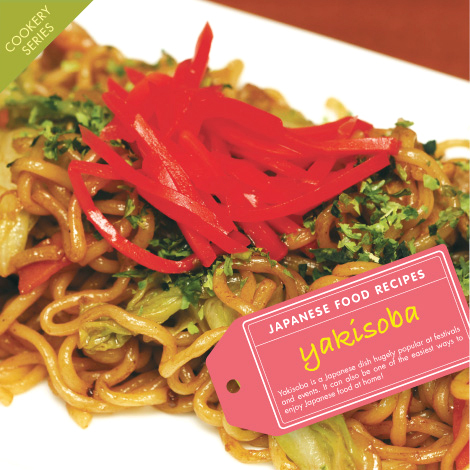 Posted in Food and tagged recipe, yakisoba. Bookmark the permalink. vegetarian version of this dish is also very tasty! !